“Scorpio Hates Virgo” contains sarcasm, sexual content, a slightly sappy HEA, and an unhealthy obsession with dinosaurs. It can be read as a standalone. I really, really loved 'Leo Loves Aries' and enjoyed the hell out of that book and while I'm not sure that I'd say I loved this one more I definitely loved it every bit as much as 'Leo Loves Aries'. Percy's returned home to the cul-de-sac after the funeral of his beloved Aunt and he's determined that he needs to sell the house that was left to him in order to move on with his life. What he hasn't counted on is that maybe the people in this close knit little community...his aunt's neighbors and one neighbor in particular would do their subtle and not so subtle best to make him see that sometimes moving on has more to do with where your heart is than your body. Within minutes of his return to his aunt's home Percy's confronted by Callaghan Glover his nemisis and verbal sparring partner. Percy's got his hands full in this one. He's determined to sell his Aunt's house and move on from the grief that it holds for him. But first he's got to deal with a cousin whose grief is expressed through anger, a neighborhood that's convinced he needs to spruce up his aunt's home and make it his own, his nemesis who seems determined to change the dynamics of their relationship and whose family is starting to feel suspiciously like they need him as much as he needs them. Then there's the neighborhood game of 'Sherlock Gnomes' that's just too tempting to resist add in some eggnog and a few carrot cake muffins with cream cheese frosting and you've got the makings of some fun and yummy times. I loved how sweet this story was and for as much as I enjoyed seeing Percy and Cal interact and watching their relationship develop and change I also loved all the neighbors and Cal's family...well, except for his dad...sorry, him I just did not understand and I really don't care to try. And I totally want to join in with the Sherlock Gnomes and play Zombie Apocalypse, this just sounds like to much fun to miss out on and hey, Leone, Theo and Jamie were on board for this too. "...But you brought more inside, Cal. You brought kindness and affection. You brought friendship." Heat pooled behind his eyes and he blinked hard, voice catching. "You brought me family." 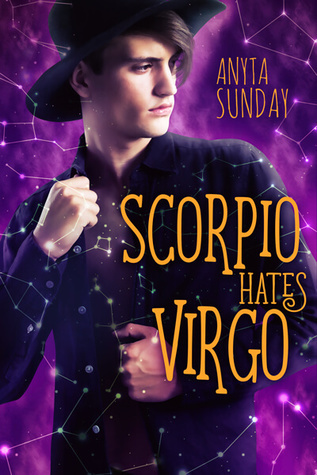 'Scorpio Hates Virgo' is a sweet, low angst, fun, enemies to lovers story and I loved the added touch of the compatibility of the different signs of the zodiac. While I'm not someone who checks their horoscope on a daily or even a weekly basis, I can't deny that in general the subject of astrology holds a certain fascination for me and in the case of this book it was just too tempting for me to resist since my son's a Virgo and I was curious to see if I would find any similarities between him and the character of Cal and I did...so needless to say I adored Cal. But, I also loved Percy too for all that he'd been through I found him to be feisty and caring and I loved that in spite of how much he claimed to want to sell the house and move away his heart was never truly into the idea. I'm curious to see what signs Anyta Sunday has planned next for this series...maybe Gemini, Sagittarius, Pisces? There are so many possibilities, I'm definitely looking forward to finding out. An ARC of 'Scorpio Hates Virgo' was graciously provided by the author in exchange for an honest review.